When I first started looking for eco toys, I found that the Europeans were much more aware in their selection of materials and design than American companies. European toys are often made of wood and are designed with an understanding that children need to play creatively in order to learn. According to Russian pyschologist Lev Vygotsky, play is the leading activity for preschoolers and kindergarteners. Play promotes cognitive, emotional and social development, but not all kind of play is equal in leading to higher mental functions. Modern children’s toys actually can hinder this development with their lack of imagination and inspiration; however, European toys offer parents an alternative choice for promoting play. Comptoir d’Enfance is a new online store started by a French mother who recently moved to North America. This store features French wooden toys, accessories, and babywear. 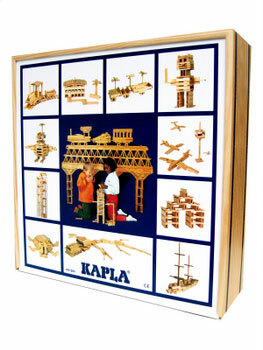 One featured toy company is Kapla. Kapla creates safe, ecological, innovative alternative toys. The wooden planks inspire hours of imagination and learning, accompanied by the pleasure of accomplishment, discovery and creation. We also put all our attention into the respect of environmental and social conditions of the fabrication of our brands’products. For Earth Day, enjoy 10% discount on our green products: Kapla wooden toys, environmental stickers and our cute organic babywear collection. It’s interesting to me that when we talk about play today, the first thing that comes to mind are toys. Whereas when I would think of play in the 19th century, I would think of activity rather than an object. Quality wooden toys, such as Kapla Blocks, bring the quality of play back into children’s lives. We need to protect our children from the commericalization of childhood and bring imaginative play back into their lives. We will have smarter children as a result! I don’t see it mentioned here, but Kapla Blocks also come in an assortment of colors that allow you to build an even wider variety of wonderful creations. I love the idea of wooden toys and my kids (boy age 9 and girl age 6) both love using their wooden blocks even today. They have been playing with them since they were quite small and never seem to tire from inventing new and enchanting stories surrounding the items they are making. Much more imagination ensues! Thanks for this recommendation! This looks like the kind of set I would love to play with!